We were excited to have held our first youth camp in Togo. The camp was directed by Moise Mabout, pastor of Douala and Yagoua, Cameroon, who was assisted by leaders from around the region. 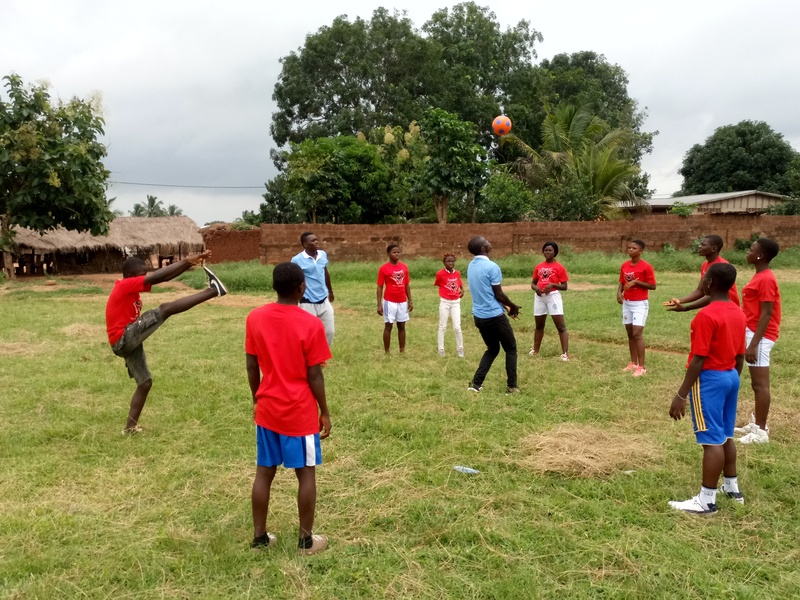 Campers and staff play sports at the youth camp in Togo. Twenty-one campers and eight staff from Togo, Benin and Ivory Coast camped at our church property of Momé-Hagou about one hour north of the Togolese capital of Lomé. Activities included soccer, basketball, volleyball, archery and christian living classes. They were also able to hold a dance, a talent show and started their day with a compass check. The food was very good (always important) and was prepared by two wonderful ladies who tirelessly cooked the entire week. We were also very thankful that the electricity and plumbing were installed just in time for us to hold the camp. Camp began with a terrible, driving rain, which if it continued would have made holding the camp extremely difficult. The following day it looked as if this heavy rain would continue. So the first morning of the camp, everyone began the day by forming a circle, holding hands and asking God to “close the sky” for the rest of camp. And indeed, that is exactly what happened for the rest of camp. Beautiful days and no issue with rain! God also protected us from someone who wanted to break through the gate at 1:30 a.m. in an attempt to steal our gear. Thankfully with aid of several of the men, Mr. Mabout was able to scare them off. We truly need God’s protection for all our youth camps. Just like our camps in the United States, a week spent together like this for our young people builds bonds and memories that last a lifetime. Everyone was sad to say goodbye at the end of the week. Tim Pebworth is the Pastor of the United Church of God congregations in Oakland and Santa Rosa, California. He also serves as Senior Pastor of French-speaking areas.